We are going to look at constructing a Game Plan that will help you and your team have a successful 2016. I like to describe this as a simple 4 or 5 point action plan that is formulated by you and your team with a view of achieving your intentions. All leaders in your business (or team members) need to be involved in setting the Game Plan, and it should be constantly communicated to everyone in the business. It doesn’t matter the type or size of your business, you always need a Game Plan! Every sales person, manager, leader, and business owner should have one. You will need to ensure the Game Plan links back into your Strategy to ensure that your Strategic Vision will be achieved. The following is a sample Game Plan that I have used successfully in a number of businesses…. Find your “WOW” Factor–what is your superior differentiator? What are you prepared to do that your competitors are not? At the end of the day, we cannot afford to carry passengers. If you’re on the bus without a ticket, purchase a ticket or…GET OFF THE BUS! As the owner of this Game Plan, you need to ensure the plan covers your KPI’s (Key Performance Indicators) and that every player buys in, this is essential for smooth implementation. Following the Game Plan will achieve Business Strategy. Achieving Business Strategy will enable Corporate Strategy to be achieved. Every team member’s input and effort is valuable and necessary to achieve results. You have total confidence in every team member meeting expectations. 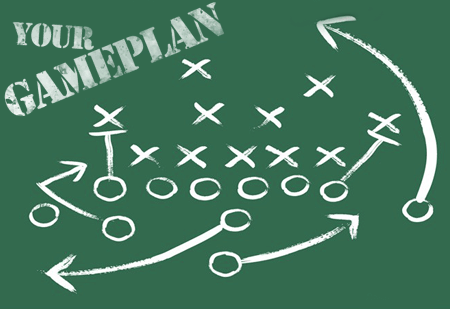 Create your “Game Plan” and have a super successful 2016!